Casino operators looking for the next wave can catch it at this year’s Australasian Gaming Expo, when Interblock unveils a new electronic table game (ETG) designed specifically for the Australian market. Casino players around the world are moving towards electronic table games (ETGs). This segment of the casino floor already comprises 15 to 20 percent of many casino floors throughout Asia Pacific/Europe. Now ETGs have come to North America, where they’re seeing double digit growth. Casino operators are embracing ETGs not only because they cost less to operate and can generate more hands/cycles per hour, but also because ETGs can bring new players to the casino floor. Recent data suggests that ETGs are driving some of the highest levels of incremental revenue on the floor, with »new carded« players making up more than 50 percent of ETG players. Interblock has also been able to customize its product to meet specific local needs. Responding to ETGs’ popularity in Australia, Interblock created a unique standalone product, giving all types of operators an exciting new way to attract players and generate more income. This Roulette edition of this standalone product, the Roulette Diamond Station, will make its debut at the Australasian Gaming Expo. The Roulette Diamond Station is an electronic gaming machine and allows operators to offer the Roulette game in a fast-paced, standalone format. The Roulette Diamond Station has the same footprint as a traditional poker machine, fitting perfectly into physically smaller venues, and game cycles can be as fast as a standard spin cycle on poker machines. Game play is similar to a poker machine, meaning the player simply presses a button to shoot the ball to initiate the game. Players can place bets on a standard single zero Roulette or a double zero roulette layout, and hit the bash button to spin the ball and start the game. Once a player has selected their bets on the roulette layout, they can simply press the bash button again to repeat their bets. A random number generator determines the result for each game, with computer-generated animation shown on a vertical LCD Player Information Display (PID). The PID simulates a real wheel and ball and allows players to track game history, hot/cold numbers, and game statistics. The Roulette Diamond Station is configurable for up to a $10 max bet and offers Simultaneous Bet Prevention Technology, standard roulette trends and history, and a racetrack view for section bets on single zero games. The Roulette Diamond Station will be Interblock’s biggest news at the Australasian Gaming Expo, but Interblock will showcase several other new and player- favorite products as well. In addition to the Roulette Diamond Station, Expo visitors will see the Interblock eTable with Baccarat, Multi-Game Video, and the MiniStar, Interblock’s world-leading roulette product. The company’s new eTable, which appeared for the first time at G2E Asia, is offered with Baccarat in a five-seat configuration and allows operators to simply press a button to change the game to play as a standard video game or with a live dealer. The eTable gives operators the flexibility to generate revenue with or without a dealer, depending on needs and preferences throughout the week or time of day. If the operator chooses to use a dealer, the dealer presses a button to initiate and confirm the game. The eTable can also support Blackjack games and Interblock side bets. Interblock’s Multi-Game Video product is also part of the Diamond line, and will be launched at the AGE show. It delivers an entertaining video experience for Roulette, Baccarat and Blackjack and has the ability to connect to any Interblock Diamond automated generator. 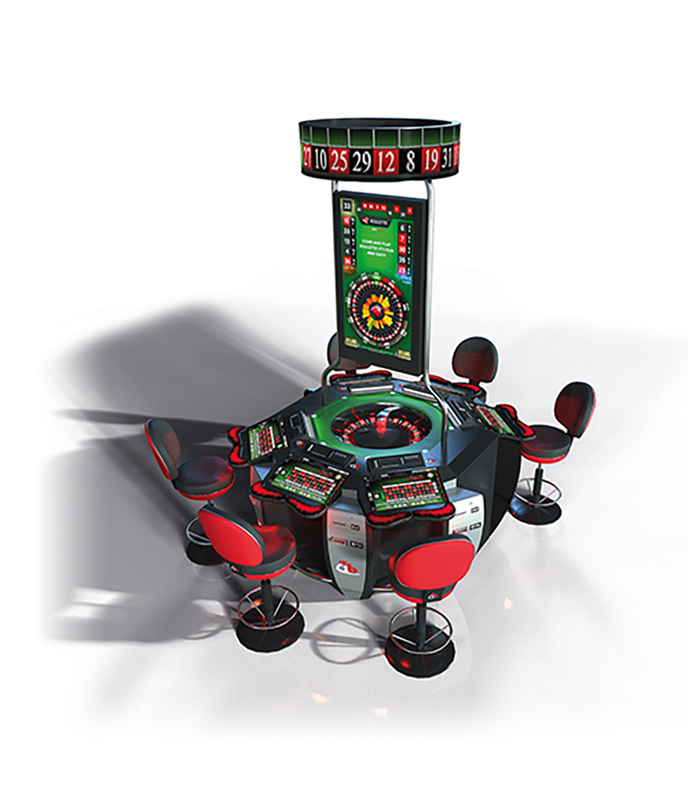 With compelling audio and visual effects, side bets, and themed virtual dealers that interact directly with players, the Diamond product line gives ultimate flexibility to operators and draws the attention of any player to any gaming establishment. They are highly adaptive to meet a wide range of design, pay systems, and space requirements. Any desired number of Play Stations can be connected to a single unit. Play Stations are equipped with wider touch screens, faster game generators, and cutting-edge games that deliver an impressive player experience. Finally, the MiniStar, Interblock’s number one roulette product, provides a multi-sensory experience that appeals to today’s always-online generation— so casino operators can attract a new, younger crowd, while also providing a premium gaming experience to established players. The MiniStar’s automated Roulette generator delivers more than 120 results per hour, which means more betting revenue for the house. MiniStar Roulette is available with six, eight or ten seats in a single or double zero roulette wheel, and offers settable minimum and maximum limits and settable time limits for player decisions.